The Georgia General Assembly is back in session! Advancing Justice - Atlanta staff and volunteers are hard at work defending immigrant rights under the Gold Dome. This year is no different than others and we continue to face hateful legislation aimed at the immigrant community. Nevertheless, we will rise to resist, protect, and advance the rights of Asian Americans and immigrants. 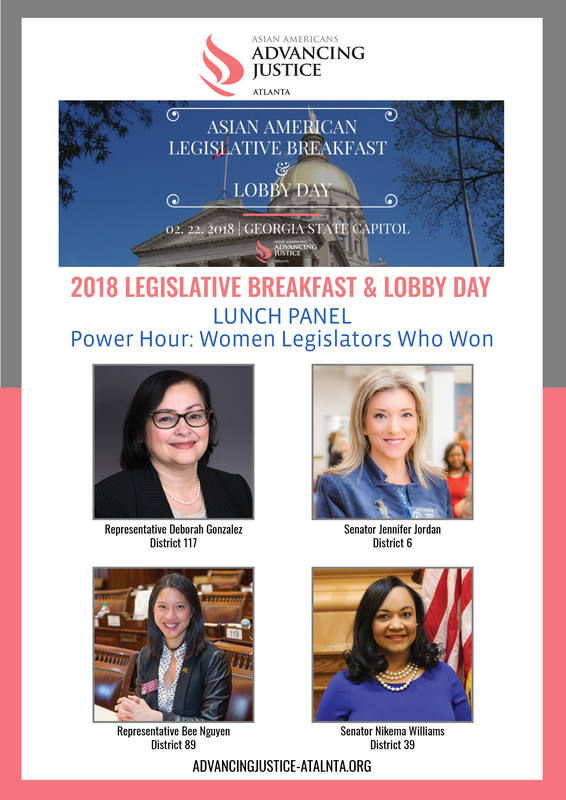 We need you to join us at our Seventh Annual Asian American Legislative Breakfast & Lobby Day on February 22nd. Come out and raise your voice around issues that matter to you. "Non-profit partner sponsorships" are available for $150 which will get you access for 10 people to the breakfast, lobby day, and lunch. 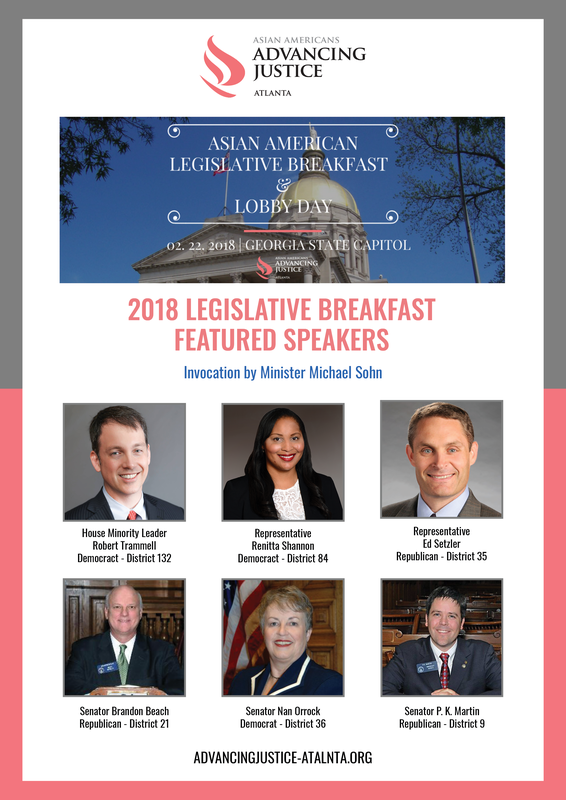 "Corporate partner sponsorships" are $300 which include access for 10 people to the breakfast, lobby day, and lunch, as well as a display table set up at the legislative breakfast. Individual tickets are on sale for $30. " 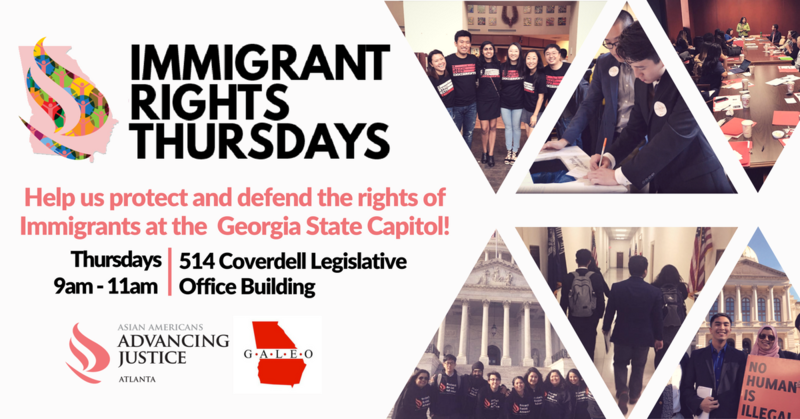 Join us on Thursdays during the Legislative Session for an opportunity to defend Immigrant Rights at the Capitol. Each year, the Georgia General Assembly introduces harmful anti-immigrant legislation aimed at our communities. We need your help to show up and remind legislators that we are here to fight back against bills that vilify or hurt our people. Come on out, starting Thursday January 25th to room 514 in the Coverdell Legislative Office Building at 9 am. Contact Policy Director Aisha Yaqoob at ayaqoob@advancingjustice-atlanta.org for additional details. Advancing Justice - Atlanta's legal services department is continuing to offer free citizenship clinics in partnership with the other members of Atlanta's New Americans Campaign collaborative. At each clinic, attorneys, BIA-accredited representatives, and other volunteers assist green card holders with their naturalization applications for free. USCIS fee waiver applications will be available. Additional information and dates are available here, or call 404-890-5655. Kollaboration ATL and Asian Americans Advancing Justice - Atlanta have teamed up to present VOICES, a monthly open mic night for our local musicians, poets, singers, orators, instrumentalists, stand up comedians, rappers, spoken word artists, and performers! Open mic is open to all ages and admission is FREE! Join us at Cafe Rothem (3585 Peachtree Industrial Blvd #128, Duluth, GA 30096)! Check out our Facebook and other social media for updates. Want to support our work? Every gift counts toward our work! Copyright Â© *2018* Asian Americans Advancing Justice - Atlanta, All rights reserved. 6040 Unity Drive Suite E.